When you switch to a vegetarian or vegan diet, you are making a significant lifestyle change. You will need to learn about vegetarian protein options and develop meal plans to receive the most balanced diet. You will also need to adjust your finances to account for the slight increase of your grocery bill. Fresh produce and some of the premium ingredients for the vegetarian or vegan diet can cost more than processed foods. Create a new savings account online to offset food costs. Online banks tend to have high savings interest rates. If you get a checking account as well, you can transfer the finds and withdraw them with a debit card. While you are at it, you can rate online brokers and invest in some low-risk stocks, bonds or mutual finds for additional food funding. Going vegan or vegetarian will not put you in the poor house; however, it never hurts to plan ahead so you can buy the best ingredients for optimal health. 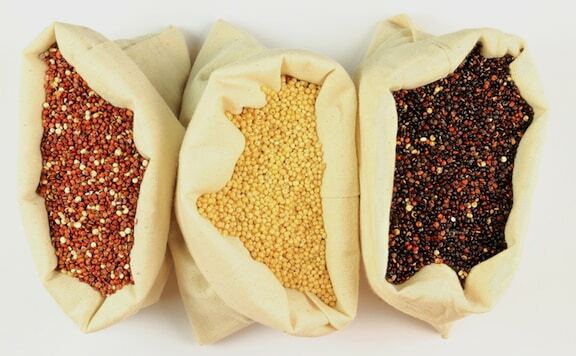 Quinoa is a seed that has the rare honor of being a complete protein. Since you won’t be eating meat, it is essential that you find alternative protein sources. Quinoa should be one of them. It is cooked similar to rice and is very versatile. Season it and use it as a side dish or as a main dish, topped with vegetables. Many types of berries are very high in antioxidants. Goji berries and blueberries are among the most nutritious. Neither is cheap, but the health benefits outweigh the expense. Eat them alone, in smoothies, atop your morning cereal or in pies. Your vegetarian meals will taste better with the right spices, and you health will also benefit. Turmeric is a spice commonly used in curry. It has antibiotic and anti-inflammatory properties. Research also indicates it may help fight cancer. Garlic, horseradish and many other spices also have health benefits. Experiment with fresh cloves of garlic and similar spices in your dishes. You may be surprised at what a small amount can do for overall flavor. One of the most exciting parts of switching to a vegetarian or vegan diet is trying new foods. For a fun switch, challenge yourself to try a new fruit or vegetable each week. If you do not live near stores offering a wide selection, look for foods online. A great bit of info for anyone wanting to lay a strong basic foundation for their vegan diet. Thanks, Pamela. Sorry for the delayed approval of your comment — I’m traveling and things tend to get buried. But I appreciate your weighing in! Good advice for anyone wanting to have healthy foods around. If you don’t like one or more of these options, no problem, just something else equally nutritious. Nava, where do you stand vis-a-vis the idea that our newly discovered hunger for quinoa is ruining South America’s agriculture and environment?